When 2nd Best isn’t Enough …. ALL THE LATEST DESIGN BREAKTHROUGHS NOT FOUND IN OTHER BRANDS …. WHAT YOU WOULD EXPECT – THE EXPERIENCE OF BEING THE LONGEST ESTABLISHED ADJUSTABLE STRUT PLATE AND BUSHING KIT MANUFACTURERS AND WITH PROUDLY “IN HOUSE” MANUFACTURE – NOT SOURCING IMPORTS / RELABELING. ALLOWING TOTAL CONTROL OVER QUALITY AND WITH IT RAPID, CONSTANT DESIGN IMPROVEMENTS (Do appreciate any constructive ideas you can suggest how we can further increase our market leadership). Genuine K-MAC NOT MANUFACTURED FROM STEEL OR SOFT BILLET ALLOY: But the very highest 7075 aircraft grade aluminum with “Extra H/Duty” self align spherical bearings (self lubed – PTFE lined) then encased in elastomer to extend life / day to day commuting (centers are also “replaceable” for virtual lifetime usage) and designed for minimum stack height. ANOTHER K-MAC UPDATE INCORPORATED INTO THE DESIGN: Separate radial thrust bearings to take the “Steering Loads” (which also resolves annoying spring drag/ noise/ binding). Massive 85mm (3 3/8″) diameter fully sealed bearings (again by far biggest in the industry) and also included are OEM diameter alloy top spring seats (along with the separate seats to suit all brands of coil overs 60-70mm I.D.). FEATURES / ADJUSTMENT RANGE: Replaces the existing Strut Top Mounts (no modifications). Reinforcing the strut towers and with the unique K-MAC patented design providing the biggest (and quickest) adjustment range of both Camber and Caster. Street/Race settings can be recorded and changed in 30 seconds – just the time taken to loosen the 3 top mount nuts. Another K-MAC Patented design feature allows this fast adjustment to be made accurately (under load) direct on alignment rack. NOTE : SUPERSEDES THE CURRENT INDUSTRY STANDARD WHICH HAS BEEN AROUND FOR YEARS – ‘SLOT’ adjustment. 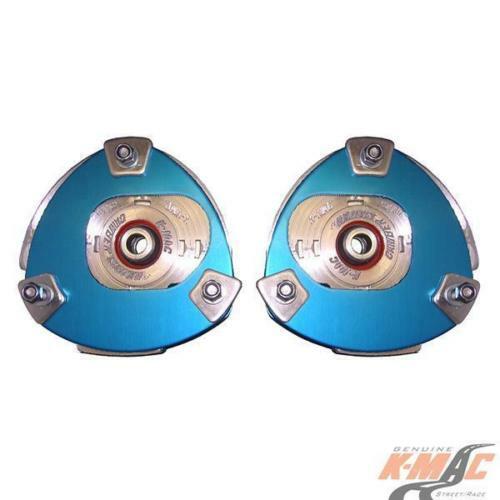 Unlike K-MAC are only available in a solid / uncompromising STAGE 3 Full Race version (steel sphercial bearings mounted on a non shock absorbing steel plate). THIS SLOT DESIGN, BESIDES PROVIDING LESS ADJUSTMENT because of the need for access to the hold down bolts, is also time-consuming to adjust and on many vehicles requires removal of the strut. Note : Most brands the “single” spherical ball is also taking the steering loads. RESULT : Finally – The adjustment capability TO CHANGE TIRE “CONTACT ANGLES” to correctly resolve costly premature edge tire wear and steering pull. The result of other than showroom height conditions – day to day commuting, encountering high cambered roads, altered height through load carrying or lowering, fitting wide profile tires/wheels and curb knock damage. Along with the ability to improve traction understeer/oversteer. *ALSO ● ● ● ● SEE COMPLETE RANGE OF “FRONT AND REAR BUSHINGS ” 1st. ITEM TO FAIL. ALL THE VERY LATEST DESIGN BREAKTHROUGHS (Experience of manufacturing performance bushings longer than anyone else – 1964). Resolving costly, premature bush wear with resultant wheel tramp, vibration, loss of traction under brake and acceleration. CHECK LIST / EXTRA FEATURES K-MAC BUSHES VERSES OTHER BRANDS: Where other brands merely replace “OEM rubber bushes with urethane “ to eliminate the OEM oil and air voids in the endeavour to improve brake and steering response. The problem here is that with today’s autos multi link arms and different mount angles, this inhibits the suspension arms traveling through their required arcs which can cause even more wheel tramp / loss of traction with arms binding, locking up and lead to breakage! K-MAC bushings therefore where required are “Mono ball / 2 axis / self aligning ” with the unique design providing more than two and a half times for both the load bearing area and shock absorption over of OEM bushes. This K-MAC design breakthrough also finally resolving once and for all the issue with “steel spherical bearings“. Their wafer thin teflon style liners used soon pounding out with resultant metal to metal contact, noise. Also because of ever increasing speed of assembly lines virtually all today’s Autos now only have Front and Rear Toe “directional adjustment”. 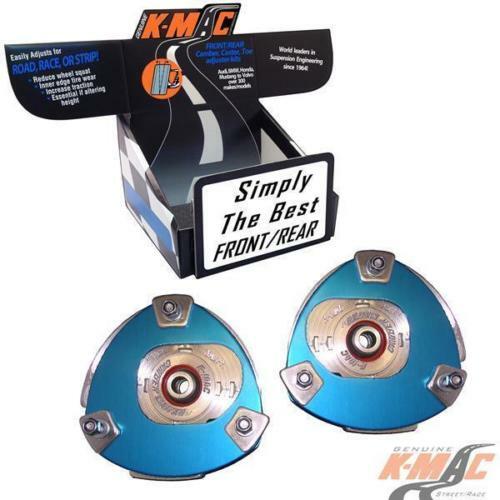 Most K-MAC bushings therefore are adjustable for Camber and Caster allowing to change tire “contact angles” – essential to resolve costly premature edge tire wear and correctly fix steering pull. THE ACTUAL K-MAC “PATENTED DESIGN BUSH ADJUSTMENT SYSTEM” HAS REVOLUTIONIZED THE INDUSTRY – PRIOR TO THIS – THE LAST 40 OR SO YEARS HAS REQUIRED THE NEED FOR LABOUR INTENSIVE DISASSEMBLY AND BUSH REMOVAL. THEN THE INACCURATE TRIAL AND ERROR NEED FOR BUSH REPOSITIONING EACH TIME TO CHANGE ALIGNMENT SETTINGS. INSTEAD NOW WITH K-MAC WE HAVE CHANGED ALL THAT – IT IS PRECISE SINGLE WRENCH ADJUSTMENT ACCURATELY ON CAR (UNDER LOAD) DIRECT ON ALIGNMENT RACK. THEN SECURED BY THE K-MAC UNIQUE “POSITIVE LOCK” SYSTEM. Worldwide - 5 to 7 days. K – MAC — With the latest design breakthroughs (see “About Us”). What you would expect from a company with all the attributes…. Constant trialing, developing in all-out 10/10ths competition racing to test / prove along with being the longest established, most experienced front and rear adjustable Strut top mounts and Bushing kit manufacturers. Proudly manufacturing “in-house”(not simply sourcing imports/relabelling). Result – Always at the forefront with total control over quality and rapid/ongoing product improvements! 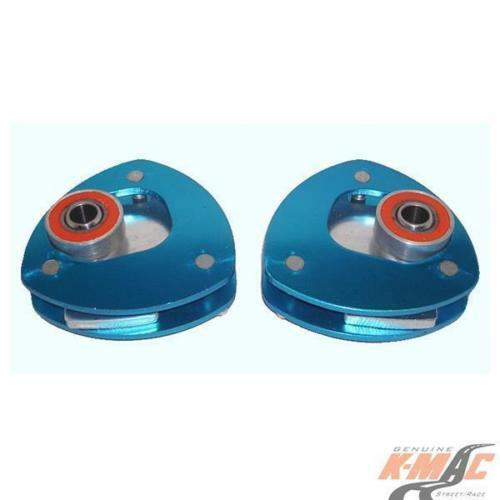 K-MAC Alignment Kits Pty Ltd © Copyright 2019. All Rights Reserved.